The best place to begin choosing a park for each day is whether or not you have Park Hopper. If you have Park Hopper you can visit one park in the morning and another in the afternoon. If you have skipped the Park Hopper option, you need to pick the number one most important park for each day. Look at the Extra Magic Hours (EMH). If you are off-property, you should not go to a park that is having either morning or afternoon EMH that day. Choose a park with NO Extra Magic Hours. Finally, consider that subscription to TouringPlans.com. While it usually posts the upcoming few weeks for public use, a subscription will give you access to a year's worth of crowd estimates. It will rate the estimated crowds for a day on a scale from 1 to 10, and it will also recommend the best and worst parks to visit on any given day. If, for example, you are deciding between Animal Kingdom or Epcot on a certain day of your schedule, TouringPlans.com may recommend one over the other. If you are relying on Disney Transportation during your stay, be cautious about making ADR's at resorts other than your own. It can be very time consuming to travel from one resort to another, and it might take up too much of your time, or be a big hassle to change buses with kids. If you really want to eat somewhere at another resort, keep travel time and your daily location in mind. If for example you would like to hit the buffet at Cape May Cafe at the Beach Club Resort, plan this for a dinner on the day you are visiting Epcot. If you are going to Chef Mickey's at The Contemporary for breakfast, or 1900 Park Fare at The Grand Floridian for dinner, plan this for a day you will be vising the Magic Kingdom. You may also consider the cost of a Taxi for early morning breakfast at other resorts. The cost will be around $25, and it may be worth the time savings. 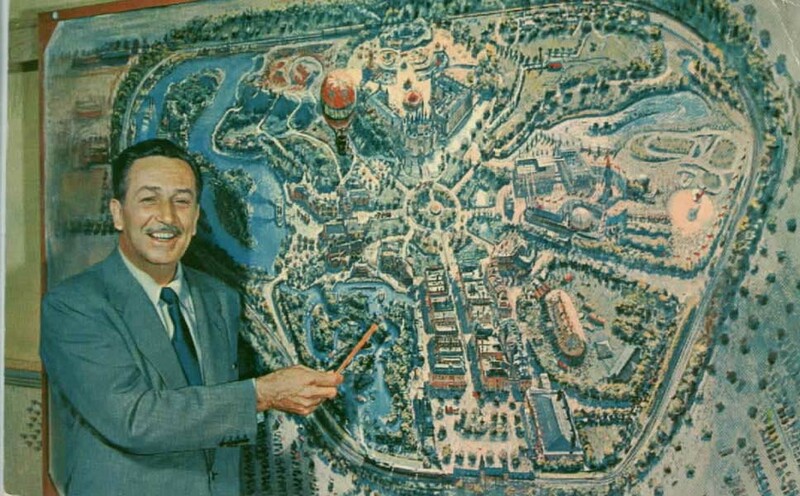 Or just make life easy and make all your ressies within the park you will be visiting, or your own resort! At this point you should have a plan of which park you will visit each morning and afternoon, you evening entertainment if any, and your sit down meal for the day. Here is a copy of my spreadsheet I used for our trip in August 2010. I personally have used and always recommend these touring plans. The first year we went with kids, I decided to use their guide for families with small children. My family thought it was a little nuts to have the day so scheduled, but it WORKED! My family thought me a genius! Before you were mostly limited to the several touring plans located in the back of the book, but now with their website, there are many many more plans. You're bound to find one that fits your family. TouringPlans.com's plans are well thought out and well researched by their own in-park teams to figure out the best way to see the most of the parks in the least amount of time. That first morning in Magic Kingdom, without EMH, we were able to see the opening show, then rode: Dumbo, Carousel, Peter Pan x2, Small World, Haunted Mansion, Mickey's Philharmagic, have an ice cream break, Winnie the Pooh, the Teacups, the Barnstormer x2, AND ride the train to the front gate all by 11:45. And this was in the summer! I won't re-post their plans here, as they belong to them, but the small $11-$12 subscription is well worth it. I do believe they have a free touring plan for each park available on the site. Choose which plan appears to be best for your family, and print it out. If something on the list is not appealing to you, just skip it and move to the next attraction on the list. Now, don't turn into a drill sergeant with those plans, but use them as a guide. You will save time just by having a plan, and then their plans in particular are designed to save time based on when certain rides have the longest or shortest waits. If you do not want a subscription, but are interested in their plans, you can almost always find a copy of "The Unofficial Guide to Walt Disney World" at the library. Rope Drop (RD) is the moment that Disney literally "drops the rope" and lets everyone into the park for the day. Yes, they actually do drop a rope! Making Rope Drop means you are there when the drop happens, and are one of the first people let into the park. To really get the most out of your time at Disney, you must make Rope Drop. Do you need to be the person AT the rope? No, of course not, but you should be part of the crowd behind those folks. You can accomplish in that first hour, what will take most people 2 to 3 hours to do in the mid-afternoon. RD is the least busy time of day. Do not sleep in, you can go back for a nap later! There is also an opening "show" at Animal Kingdom, and a little countdown at Epcot. Hollywood Studios has a little coundown, and then honestly it is slight chaos as everyone chooses Toy Story Mania or Star Tours as their starting point. 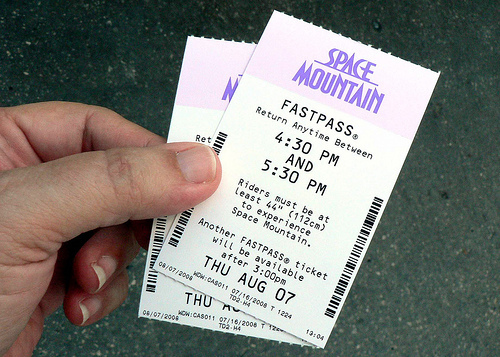 Rope Drop is the ideal time to pick your top two rides and get a Fastpass for one and ride the other! 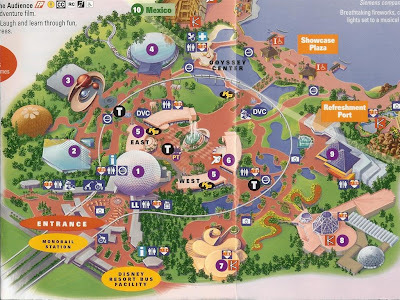 You could also exit Epcot via the International Gateway (between Great Britain and France) and walk to either the Boardwalk, Beach Club, or Yacht Club resorts and wander, or just find a bench to sit down and rest. The American Adventure is a 25 minute animatronic stage show that is cool and dark, several of my family members have fallen asleep during this show. "Do You Have An Exit Buddy?" 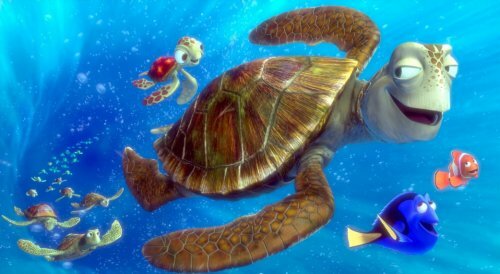 - Crush in the movie"Finding Nemo"
In order to maximize your fun time, and decrease the time spent waiting on line for your bus/boat/Monorail/parking lot tram at Park Close, you need to have an exit plan for each park at closing and/or after the evening entertainment. This is by far the most important park in which to have an exit plan, and there are several options. The most important starting point is "Are there two parades tonight"? Plan A: (my personal fav) Stay Late! You will spend less time in line to exit if you stay for the later parade or stay in the park a while after the Wishes firework show. Don't underestimate the sheer number of people leaving immediately after Wishes. 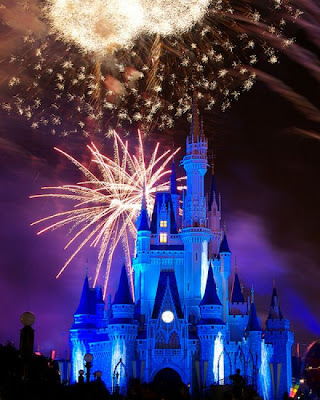 No matter if there are one or two parades, most people watch the first, then stay for Wishes fireworks, then leave immediately after the fireworks. Therefore, you don't want to be one of them! Stay and see the second parade, if there is only one, and take your time exiting, or get a good location near the exit (see Plan B for a recommendation). A good parade viewing location is usually much easier to get for the second parade, maybe 20 minutes ahead of time. If there is only one parade, see Wishes, and again take your time exiting. The shops on Main Street USA stay open an hour or more after official park closing. Take your time and mosey through the shops, window shop, and pick up all those Mickey Souvenirs you've been wanting. After 30-40 minutes or so, you can consider a restful walk to the exit. Or just sit on Main Street and soak in the Magic. The lines are usually much shorter for the buses and Monorails by now. Although you might think you want to leave earlier to get the kids to bed, staying an hour and a half later in the park, may only get you back to your room 30 minutes later than if you left immediately. Plan B: (only if you are desperate) If you really must leave with the throngs of fellow Mouseketeers, you should position your viewing area as to allow for a swift exit. While the balcony of the train station is popular, you must get there incredibly early, so I don't feel its worth it. The best locations are on the street, either in front of the train station facing the castle, or across the street from the train station on the curb of the flagpole area. You will have your back to the castle to watch the parade, then turn around and face the castle to see Wishes. If it is a busy time of year, you may have to stake out your spot an hour ahead of time. Immediately after wishes, do not hesitate, do not pass go, do not collect $200 Disney Dollars, but turn around and swiftly head out the left exit toward the buses. Do not run, but give it a New York walk. If you are pushing strollers, look for the Cast Members with the large white Mickey gloves, they will direct you to the stroller exits. 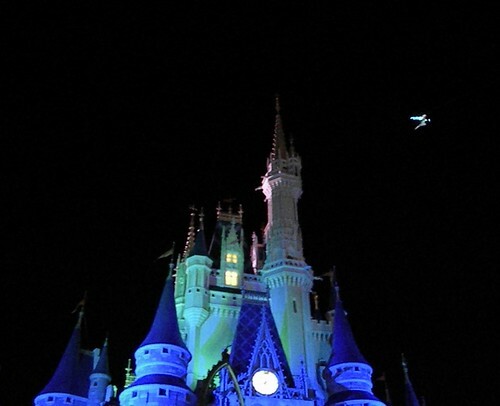 You'll need to decide what is most important to you, an ideal location to watch Illuminations, or an easy exit. The docks right by the "Showcase Plaza" tag. To the left of the tag, the stores mirror each other. If you decide you want the best viewing location, you may have to sacrifice an easy exit. We like to see the show, and still get out in a reasonable time frame. I find the best place to do this is in the area where Future World meets World Showcase, in between the two Friendship Boat docks between the two gift shops. 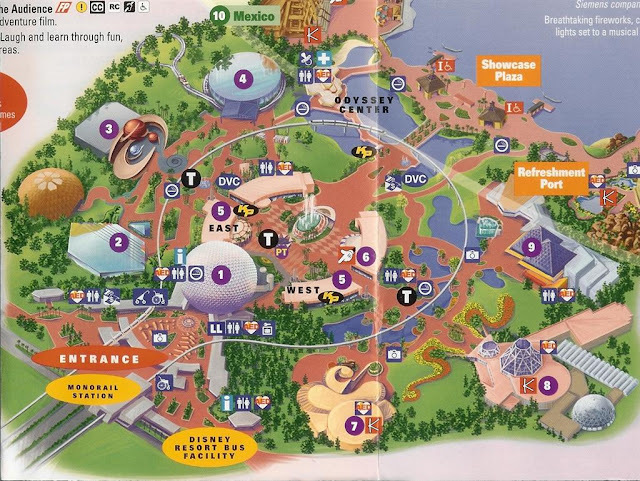 In the map above, you can see the area in the upper right corner labeled "Showcase Plaza", behind the boat docks, there are two gift shops, and between the two gift shops are two grassy planting areas. THAT'S IT! We like to stand right behind or around those grassy areas and watch the show. As soon as the show is over, about face, and out you go swiftly across the bridge and head past Spaceship Earth (the golf ball thing) and to the exits. Again, be safe, but this is not the time to mosey. Granted you are not right at the edge of the water, but we can still see pretty well, the area is never crowded, and we are always one of the first groups to the bus stop. We are probably back at our resort before the people who were watching from the American pavilion are even at the bus stop! See that staircase all the way on the edge of the crowd? That's it! This is really only necessary for Fantasmic nights. 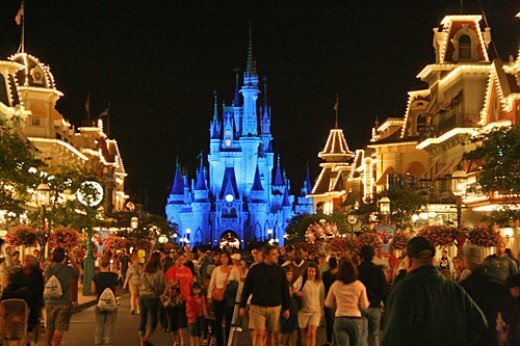 If the park has no Fantasmic and a regular closing time, either leave a little early, or stay and shop your way out as in the Magic Kingdom plan. During especially busy times, there may be two showings of Fantasmic, of course, as in the Magic Kingdom, going to the later show is preferable. It will be less crowded and you will have an easier time exiting. If you are going to see Fantasmic, I have found a slightly hidden official way out! After the show is over, stay in the stands, and proceed all the way to the right side of the seating area (as you look at the stage) to the Dining Package area. Take that last exit all the way on the far side of the seating area. Once out of the seating area, go left down the pathway at a safe clip. This is the same pathway that that the Dining Reservations folks come in. There will be many others going this route as well, but the majority will exit the way they came in, and end up near Tower of Terror. The path will take you behind the Beauty and the Beast stage. At some point close to the end of the path, it will split (usually). Take the left. You will come out right by the restrooms and camera shop on Hollywood Boulevard. Make a bee line for the exit to your left and off y0u go! If you can't go left at the split in the path, then continue on straight ahead, and you will end up back on Sunset Boulevard. You still have a slight head start just because the route is shorter and less crowded than the main exit. *I have yet to find this path on any official Disney map, but I've taken the route several times and it does indeed save you time. Well, this page is has got A LOT of info! But these tips and tricks are how my family enjoys all that Walt Disney World has to offer while staying cool and avoiding long lines at attractions. You could still try to wing it....but I wouldn't recommend it.